From the creators of the #1 selling-PC adventure games comes a new Nancy Drew story-driven casual series that is Fast Fun for Busy DetectivesTM. Nancy Drew Dossier hidden-object games immerse you in a suspense-filled hunt to piece together concealed clues as you search and seek to crack the case. A bomber plagues the Redondo Spa! Can you defuse the situation? The annoying explosives are pranks, but it could drive away the Redondo’s clients and celebrities. Nab the culprit or you’re out of business! 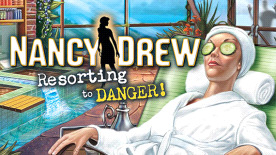 Second game in the hit Nancy Drew Dossier series! © Copyright 2009 Her Interactive, Inc. HER INTERACTIVE and DOSSIER are trademarks of Her Interactive, Inc. The HER INTERACTIVE logo is a registered trademark of Her Interactive, Inc. NANCY DREW is a registered trademark of Simon & Schuster, Inc. Licensed by permission of Simon & Schuster, Inc.